Minnesota Gov. 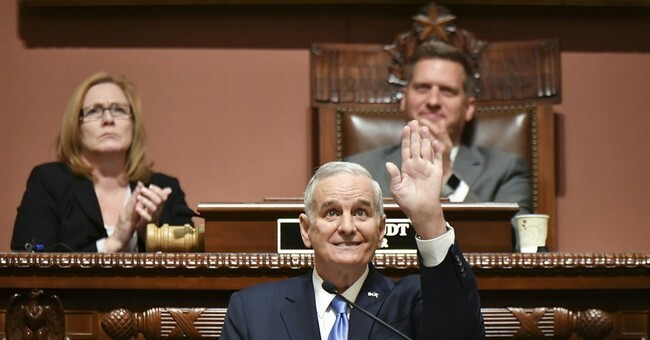 Mark Dayton (D) had a scary moment on Monday night when he collapsed while giving the State of the State address. Dayton quickly regained consciousness and left the room on his own power, and his office released a statement that evening. On Tuesday, Dayton revealed that he was diagnosed with prostate cancer last week and he may be facing surgery. He was not planning on announcing his medical condition until he knew exactly how he was going to treat it, but last night's collapse forced his hand on the issue. He said that he intends on finishing out his term. Dayton, who turns 70 on Thursday, said Tuesday he wasn't intending to disclose the diagnosis until deciding on a treatment plan, but last night's episode sped it up. His cancer treatment plan is not clear at this point. Dayton said he had no reason right now to believe his fainting was connected to his prostate cancer diagnosis but added that he hoped to learn more after his doctor's appointment later Tuesday afternoon. Dayton said he didn't sense problems last night until right before his collapse; he said he started to not feel well less than a minute before he fainted. Our thoughts and prayers to Gov. Dayton for a speedy and complete recovery.